The Islamic State (IS) militant group has destroyed part of what's considered the most important temple at the ancient Syrian site of Palmyra, activists and witnesses say. The militants seized control of Palmyra in May, sparking fears for the site. The BBC's Jim Muir, in Beirut, says that for the extremists, any representation implying the existence of a god other than theirs is sacrilege and idolatry. Diane Darke, a writer on Syria and author of the Bradt guide to the country, told the BBC that the Temple of Bel was a massive structure which had been used as a fortress, a church and a mosque. Syrians themselves despair that it takes the destruction of a temple to make everybody focus on their country, she said, but they do also feel the loss of their cultural heritage. 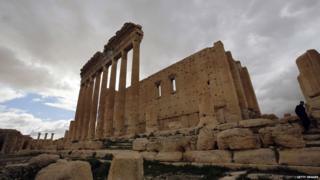 "There will be Syrians weeping all over the country at the loss of Palmyra, of the main jewel of the site," she added.